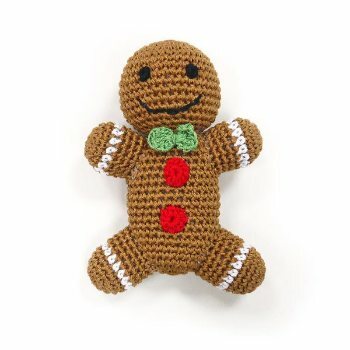 Crocheted toy is perfect for holiday gift giving at Christmas time. Handmade interlaced cotton thread, designed to be flexible, durable, and improve dogs dental health by removing deposits of calculus. Dogo added a squeaker inside the toy to add to your dogs chewing fun! The Gingerbread man Dogo dog toy measures about 5 inches tall.